Page 48 of your print book is missing four lines of text at the top of the left hand column. Click here to access the correct page 48. Feel free to print out this page and insert it into your text. 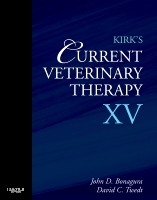 Thank you for visiting the companion website for Volume XV of Kirk's Current Veterinary Therapy. Featured are all of the images from within the book, with many presented in full color. The comprehensive image collection makes it easy for you to view the images in one place and incorporate them into presentations. The book's references are organized by chapter and are linked to their original abstracts on PubMed. The website offers 86 additional chapters that are not printed in the book. Those chapters provide expert clinical guidance on topics that apply to current practice. You will also find a wealth of fully searchable supplemental content including appendices, a completely updated drug formulary, and an index based on anatomic and physiologic disorders.